You can never have enough of these microwave receivers…. The 1295 receiver – before working on the internals, the external parts – the panels – needed a makeover. (1) Sticky paint removed from side panels, top and bottom panels, using methylated sprits. Imaging scraping off dark green chewing gum, several square feet covered with it. Hope the company that sold this paint is now out of business, that’s what they deserve. (2) Some more cleaning and sanding, with 400 grit paper. (3) Primed with self-etching automotive primer. For coating aluminum metal, always use a suitable primer – don’t trust any suggestions on paint cans that it will work without a primer. It won’t. After some drying, a quick sanding. Not aiming for perfection. (4) Top coat with a modified alkyd resin. “Hunters green” appears close to the original color shade. (5) After several hours air-drying, burn-in at about 165 °C, for 60 minutes. This improved adhesion, at least based on my past experience, and no need to wait for days before the instrument can be re-assembled. (6) Clean the newly painted surfaces with isopropylic alcohol, this gives an even shine, and to confirm that the new paint is fully resistant vs such solvents. (7) Re-assemble all the small hardware and screws, feets, etc, of the panels! (1) Added filter caps to the YIG driver, when under remote control (more or less a bug in the Micro-Tel circuit). (2) Added a parallel ot serial converter to the display – the readout values are now transmitted via 2400 baud, via the external control connector. See post in the attenuation measurement section. The circuit involves an ATmega32L which monitors the display for an update, and with every update occurring, it reads out the value, and does the transmission – no handshake. (3) All frequency related and AFC adjustments, YIG driver adjustments etc. have been performed. Calibration of attenuation levels checked – seems OK – precise calibration, I can only do back in Germany. But seems to be in-spec, and will compare more throughly vs the “master” 1295 – the first unit. (4) The light of the mains switch, using a T1-1/4 28 V 0.04 V incandescent bulb, with broken filament – replaced by a LED, with an added 1 k resistor in the supply line. (5) Fitted a spare 2″ display bezel, with red filter – the original one was missing. That’s the gem, receiving at about 16.260 GHz. 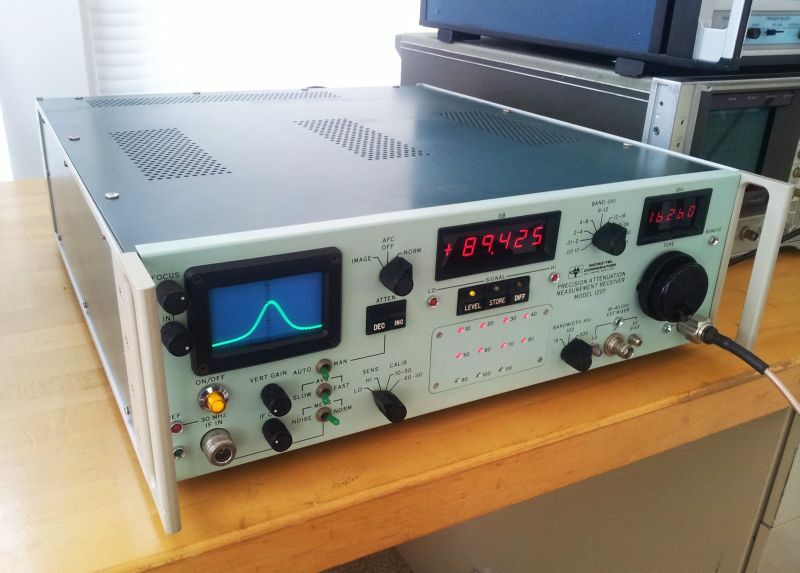 Micro-Tel 1295 Precision Attenuation Measurement Receiver: 2nd unit!! Recently, I haven’t been acquiring a lot of test equpiment, for my own workshop aka museum, because space here in the US is limited, and carrying all these things over to Germany again in 1 or 2 years will be a hazzle. But this time, I could not resist – a Micro-Tel 1295 receiver, for less than 1 ct. per USD 1980s list price! The parts alone, a 2.33 GHz low noise LO, 2-8 GHz Avantek YIG, 8-18 GHz Avantek YIG, a 2-18 GHz broadband coupler, various microwave mixers and attenuators, all of the best mil-spec quality, well worth it. Also, it will be a great addition to the precision attenuation test set-up: a dedicated receiver each, for the through and reflected power! And, we can safe one coaxial relais (to switch either through power, or reflected power, to a single receiver), and everything will be faster, by almost a factor of 2. The only downside – another PLL will be required, but well, this is just a matter of a rainy weekend. It arrived well packaged, no damage, except a missing frequency display bezel (which was easy to source, exact fit), but one thing I did not expect: the paintwork on the upper and lower cover, and side panels, has converted into a mixture of honey and chewing gum, a sticky mess, and dark green! So, first task was to strip off this “paint”, which was pretty easy using some methylated spirits, and engage a bit in spray painting. Hunter’s Green. See the dark green side panel – covered with sticky paint! Now, it is finally clear to me, why the 1st unit, the 1295 acquired earlier, had been re-painted by his former owner…. Note that the lid and side panels have numerous screws and nuts (more than 100 single pieces!) – quite impressive, how little Micro-Tel had to consider manufacturing cost! One issue found so far: the IF distribution relais had some intermittent noise – most likely a bad contact somewhere. 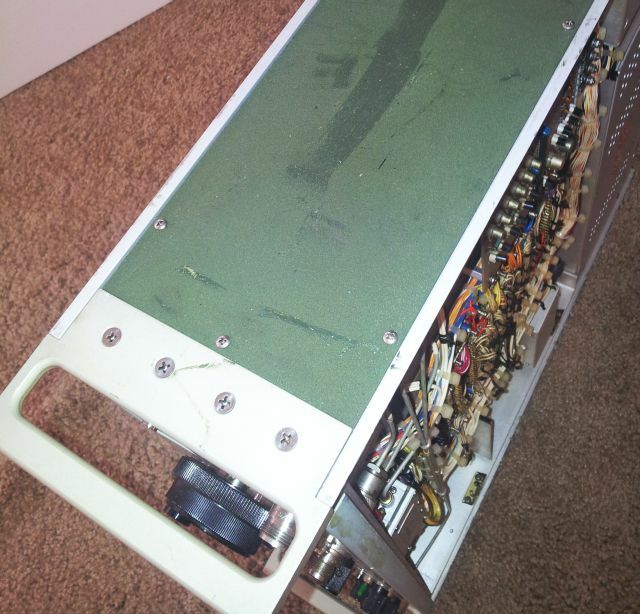 So took out all the board, cleaned up the edge connectors (all gold plated), and moved the connectors around a few times – and, the issue is gone. A note on edge connector cleaning: this is best done, from my experience, we some special type of eraser. Don’t use anything harsh, abrasive, or natural rubber. It will either scratch it gold coating, or leave traces of residue behind that isn’t going to improve contact resistance and reliability. Best suited at vinyl erasers made especially for PET film or tracing paper. 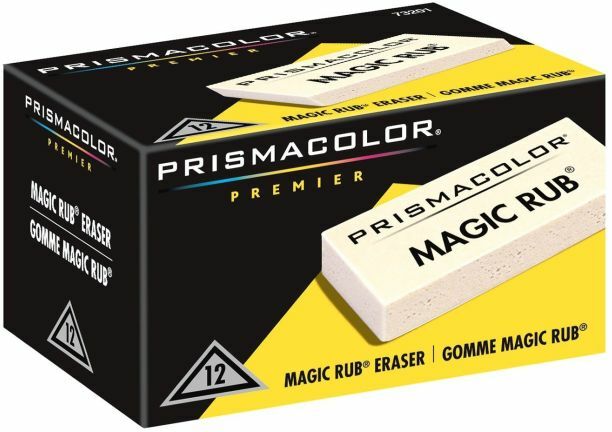 Prismacolor Magic Rub. These crumble a bit, but the vinyl materials absorbs all the dirt, and can be brushed of easily, with an ESD brush. The unit is overall very clean, just the frequency calibration/display seems to be quite a bit off. This will be the next step, after a thorough warm up. And, as for the first unit, I will add a parallel to serial converter for the display, same as for my main Micro-Tel 1295, because I don’t want to use the IEEE-488 bus for this device. It will have the same 2400 baud (TTL-level) serial output. Also, a little capacitor will be added, to limit the bandwidth of the Freq Control/YIG driver amp when in external mode – this seems kind of a bug of this device, because the larger bandwidth only increases noise, and the receiver is not build for fast sweeping anyway.